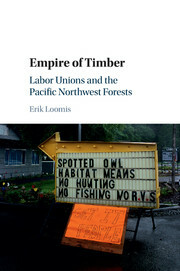 Focusing on everyday labor and the designs of union activists, Loomis provides a complex portrait of how the industry’s base attempted to advance its goals of securing both sustainable forest resources and health and safety protections for men and women in an often dangerous workplace. The result is an informed analysis of labor’s successes and failures, one that broadly encompasses the radicalism of the Industrial Workers of the World (IWW), the challenge of the International Woodworkers of America (IWA) to midcentury forestry policy, and organizing efforts by countercultural reforestation cooperatives in the 1970s to oppose herbicide exposure. Drawing productively on Thomas Andrews’s notion of “workscapes” and Rob Nixon’s concern with “slow violence,” the author demonstrates how the IWW, and the industry-sponsored Loyal Legion of Loggers and Lumbermen, initiated reforms to an increasingly industrialized work environment that punished bodies through the speed of production or the creeping pathology of disease from poor camp sanitation. A more holistic approach to the “total work environment” (p. 133) was later adopted by the IWA to moderate the debilitating impacts of postwar production technology; the union marshaled evidence from scientific sources and eventually called upon Occupational Safety and Health Administration regulations to combat the effects of new ailments, such as the auditory and neurological consequences of prolonged chainsaw use and the toxic impact of chemicals, such as pentachlorophenol, used in mills. Loomis’s description of union critiques of industrial forestry’s destructive practices—decades before the modern environmental movement—is equally illuminating. In 1945, recognizing the need for technical understanding, the IWA hired its own professional forester, Ellery Foster, to help union leadership anticipate the long-term goals, and contested meanings, of sustained-yield forestry. Foster was instrumental in shaping the IWA agenda, arguing for federal regulation over private forestry in the interests of community stability, and moderation in the push to exploit public lands. Through IWA advocacy, timber workers began to establish tenuous links to environmental groups, endorsing the 1964 Wilderness Act and supporting wilderness areas such as the Olympic National Park and Three Sisters Wilderness; this collaboration would enhance worker leisure opportunities and conserve subsistence resources such as fish and game. Unfortunately, the influence of the IWA was often countered by the United Brotherhood of Carpenters (UBC), a conservative union that lobbied to increase logging and opposed expansion of wilderness areas, notably the Redwood National Park in the 1970s. In their harsh rhetoric and public protests, the UBC established a precedent for timber workers’ future opposition to endangered species regulations and ecosystem management proposals of the 1980s, even as automation, exports, and global shifts in capital investment represented greater threats to employment prospects and union strength.